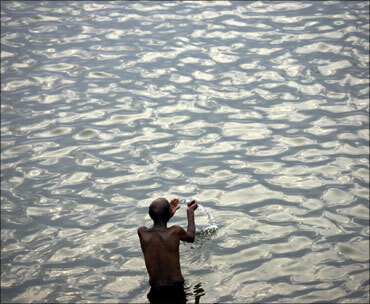 Rediff.com » Business » The death threat to Gori Ganga! The death threat to Gori Ganga! If you are confused about the severity of human-induced climate change, it might help to focus on the death threat to Gori Ganga, says Rajni Bakshi. Anger, confusion, relief -- a jumble of emotions has been triggered by the news that Himalayan glaciers are not going to dramatically melt by 2035. In the midst of this tumult it was a calendar on 'Gori Ganga' -- white Ganga -- which helped me to refocus on what is at stake here and what could be done about it. It is natural to feel angry with the sloppiness of a Nobel Peace Price winning scientific body, the Intergovernmental Panel on Climate Change (IPCC), which recently retracted its earlier report that claimed that many Himalayan glaciers may recede dramatically by 2035. Those who depend on front page news for a broad knowledge about our changing environment, now feel confused about just how severe climate change really is. Some of them are wondering if there might be more truth in the counter-view that there is no human induced climate change. And then there is just plain relief because the prospect that glacier-meltdown would reduce our great rivers to a trickle in our own lifetime was unbearable even for those who do not regard themselves as 'environmentalists'. My primary response has been relief because putting a date on doomsday was never an effective way to galvanize large-scale public action. For every one person who lost sleep over the 2007 reports on catastrophic depletion of Himalayan glaciers there are probably nine people who chose to ignore it. A projection of that kind is just too big, unwieldy. Many people treated the glacier news in the same way that they react to projections about a large meteor due to fatally strike the earth in year such and such -- they dismiss such information with a philosophical shrug. So if gloom and doom projections about environmental degradation don't help bring about the scale of change that is needed what will? Nothing beats a sharp and urgent focus on the here and now. For activists of the Uttarakhand Nadi Bachao Abhiyan this means both the bliss of working along the upper stretches of pristine mountain rivers and the challenge of documenting the many immediate ways in which these rivers and their source glaciers are now threatened. Among the members of this Abhiyan is the People's Science Institute (PSI), Dehradun, which was set up about twenty years ago by a group of IITians. Over the years the PSI has done detailed studies on, both, the depletion of the Himalayan environment as well as the community-based efforts to restore eco-systems. Such work is a sharp reminder that the scale and speed at which we are damaging even our pristine natural areas is cause for worry and urgent action. This reality is in our face -- regardless of what disputes there might be on projections about climate change. And yet, instead of trying to alarm us into action, the PSI has chosen to put its stark political message behind joyous images of pristine wilderness on a wall calendar. Gori Ganga is the name for a stretch of gushing and white-foaming tributary, which geologists call a 'wild river'. It emerges from the snout of the Milam glacier at an elevation of 3,500 meters and trundles through the upper reaches of the Nanda Devi range to join what eventually becomes the 'Ganga'. For the people who live in the vicinity of Gori Ganga, and scores of other such wild rivers, climate change is a relatively distant enemy. Imminent danger takes the form of five hydroelectric projects that are being planned along the 107 km length of the Gori Ganga. These projects will divert the river into a tunnel and drop it several kilometers downstream to a powerhouse. Since the river bed downstream of the dams will become dry -- this will kill both the river and its life sustaining ecosystem. As it fights to save rivers like Gori Ganga, the Nadi Bachao Abihyan is asking us all to consider if the development which those hydro-electric projects represent, is truly in our collective self-interest. Is the destruction of unique aesthetic, recreational, cultural, biotic, economic and historic values really worth it? The Himachal Pradesh legislature has passed a resolution to protect another pristine river, the Tirthan. Environmentalists greet this as slow baby-steps in the right direction while calling for more rapid momentum. Others view such moves as impediments to rapid economic growth. But, as Ravi Chopra of PSI points out, the preservation of Himalayan rivers is as much a livelihood opportunity as an environmental imperative. Eco-tourism is a growing field. This can be leveraged to foster community-based mechanisms which enable tourists to, in a sense, pay for an assortment of environment enhancing measures. These include rehabilitation of depleted water sheds, more efficient harvesting of rainwater for household use and irrigation, plus efforts to preserve the quality of water, flora and fauna. "We are convinced that it is possible to develop our hydropower resources in a sustainable and caring manner so that the people prosper even as our rivers are conserved," says Chopra. Thus the PSI is carrying out studies to determine how much water should always be left flowing in our rivers. I am not suggesting that we neglect the geo-politics of climate change in order to focus more sharply on such micro initiatives. There are tough national and international battles ahead about equitable distribution of, both, natural resources and how much of nature's sinks each nation can use up. But in case you are feeling confused about the severity of human induced climate change -- true or false -- it might help to focus on the death threat to the Gori Ganga. She beckons us to take stock of our own lifestyles and the real costs of what we consume. While inviting engagement and suggestions from people across India, Chopra reaffirms that it is possible for us to become gentler, more caring people who are willing and able to protect our natural heritage. So the PSI's calendar puts out its message not by attempting to scare us with projections about the future but sending us images of what draws millions to the lap of the Himalayas every year on holidays and holy pilgrimages. But here's the catch. Several decades of environmental awareness have ensured that many people now realize that the regenerative processes of nature are slow. A wilderness destroyed or damaged is hard to restore. What we have not yet cracked is a way of linking the joy we all feel up there in the mountains with a mass movement to change how we are treating the world of Gori Ganga. Rajni Bakshi is a Mumbai-based freelance journalist and author of Bazaars, Conversations and Freedom: For A Market Culture Beyond Greed And Fear. Climate change may kill 400,000 children p.a.